This week's photo prompt is an image of a 'Mirror Man'. This is one of four sculptures that was on display at the Four Season's hotel, in St Fillins, Scotland, back in 2013 (although a comment on the site in July 2017 suggests there is still one there). They stood in Loch Earn for visitors to enjoy. The hotel commissioned artist/sculptor/photographer Rob Mulholland to make them. This particular photo was taken by Flicker user Alec Gibson. My first attempt at writing for the picture seemed lack-lustre - particularly in light of the picture. I did make a second attempt but didn't like it, so reworked the first. I hope you enjoy it. Lori lay in the plush surroundings of the room she’d booked for the week, absorbing the peace and the early morning light that streaked across the thick carpet. The bed was warm and cosy. She didn’t want to move. She was exhausted – physically and emotionally. Touring the country to promote her work had taken its toll: all the talking, the standing, the pacing on stage, the networking, the late nights, regurgitating the same old answers to the same old questions, finding new ways to say the same thing and give the same advice; eventually the mind gets fuzzy with all that noise. And then coming home to find her home gone, her possessions gone, everything she had owned and all the art she’d had stored there, gone. Her adjoining neighbours were also gone, the gas explosion having emanated from their boiler, taking the lives of their children and their pets. It had made her feelings about the loss of her art seem trivial. And then it had all stopped; she hadn’t been able to function. Family took her in, but she couldn’t get her thoughts together, her mind constantly returning to all the time and effort that had been wasted, how easily it had gone, and how it all seemed so pointless now. Every time she attempted to do anything creative she drew a blank. So after more than a year of nothing, despite finding another home and settling again, and with the pressure to provide more work for sale and exhibition mounting, she had booked this trip in an attempt to relax and just be for a while, without any expectation. As the room became brighter with the rising sun, Lori was lured out of the bed by curiosity. She had arrived late the night before, so had yet to glimpse the views promised when she had made the booking. She was not disappointed; the Loch swept away to the horizon, the lodge perched at one end of it. Sunbeams peeked through broken clouds lighting up the water, creating a myriad of sparkles that danced across the surface. Lori felt drawn to it. She wanted to get closer, even touch it if she could. She dressed and took the main stairs down, hoping not to encounter any guests or staff. The early hour afforded her this luxury, and she left through the front door unseen, striding across the lawns at the front down to the water. Once there, she was relieved to find a small strip of shingle enabling her to step into the water. The cold bit into her toes, but she found the chill refreshing as she continued in until the water was at her knees. Lori stood still, letting the cold numb her lower legs while she watched the light glitter across the surface. At this angle she felt as though she was a part of the glimmer, as though it reflected off her too. The warmth of the sunlight kept her there, disembodied from the knees down. She imagined herself floating on the surface, her body rocking with the sway of the water while her mind drifted with the clouds above. She wanted to stay there forever, imagining herself a statue like those she used to create. But as the freezing water started to lap at her thighs, she came too, knowing it was time to return to the lodge and hopefully breakfast. Lori went to turn but nothing happened. At first she thought her feet had gone to sleep, but her upper body hadn’t moved either. She tried again and nothing happened. Looking down, she was shocked to find her torso a beacon of light. It shone out of her, moving and jostling, scintillating like the light on the water. She moved her hand to touch it and found her hand reflective too, her eyes captured by its trancelike qualities. She had become as beautiful as the radiance around her. She wanted to capture this moment, and recreate it in art. Her head buzzed with ideas and this seemed to unlock her. 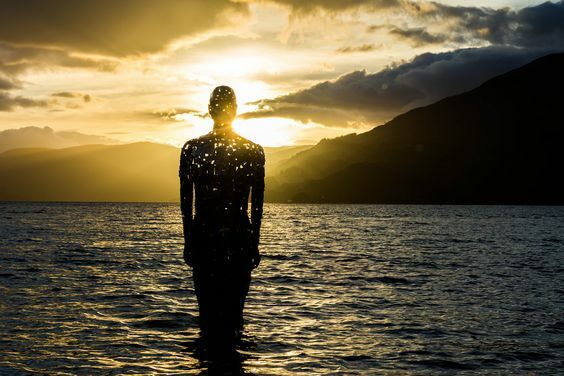 She moved; the light across her body dying as she turned and waded out of the water, wanting to return to the lodge and release the images lining up in her mind clamouring to be created. The need for rest and peace was forgotten. Lori’s mind had come alive with what it needed to construct. This would be her greatest work yet. This week's photo was taken by Hendrik Sorensen, a Danish born photographer and filmmaker. He takes some incredible pictures; you can view on his website here. It has so much to offer, look forward to what you will make of it. I had a couple of false starts with this picture, where I felt like I was rehashing the same old story. So I basically ended up with the rush of emotions it brings to me, written in a form of prose. Flash writing can, afterall, be whatever it needs to be. What is it like to feel you can’t show your true self, feeling you have to hide it from the world? When you can’t be who you want to be; when everything around you stifles and chastises you? It’s like dancing under water, trying to move elegantly and beautifully while being restricted, each movement an effort as the water pushes back against your limbs; holding your breath, fearful to release it as though doing so might bring the end of you. The pressure on your lungs painful in your chest, squeezing you heart. I want to soar and rise, and burst free from my shackles; release the burdens holding me down. I want to let the light from within me shine out like a beacon to guide others, and not be scattered or reflected off things or people around me, which diminish or leech off it. I want to fill my lungs with the air of freedom. I want my heart to expand with joy; to liberate and open it up to giving and receiving. Most of all I want to grow, and be, and live. But until that time, I will keep on swimming my beautiful dance; appreciate what I have to offer in my confined space, and do it with grace and sophistication. I ummed and arhhed over which tale to tell as several vied for position, although I felt a few were a bit cliche or darker than I fancied going. So this is what got written. The sloshing sound and rocking motion woke her. Her eyes focused on the slats of wood far above her head. She kicked her feet and heard splashing; they were underwater. She put them down and felt mud and seaweed debris squelch between her toes. She tried to raise her arms to balance but found them tied to one of the pier posts. Damn! She’d forgotten about that. Veronica awkwardly tried to stand, but couldn’t get up to full height, the rope tied round her wrists restricting the ability to do so. She could only move the rope up the post a little. Bent over with legs straight, the water had reached her thighs; the tide was coming in. She look back at the beach, but it was wet and windy; there was no-one in sight. She looked at the rope. It was orange poly rope: extra strong, extra tough, not easy to break. It occurred to her that if she had been able to tie herself up, surely she would be able to untie herself. Then she smiled; ever the perfectionist with attention to detail. She’d practiced that knot for months, tying it with her teeth, but never quite foolish enough to tie both hands in – not until last night. She had no simple answer to this. She considered whether chewing through it was possible. Looking round again at the deserted beach and promenade, there wasn’t going to be any other option. Veronica gnawed at it, kneeling in the water to keep her balance as the current of the incoming tide pushed against her. Her mouth was dry and salt water kept splashing up, making her need to spit. After a while she stopped, barely having made a dent in one of the winds of rope – there were three to get through. 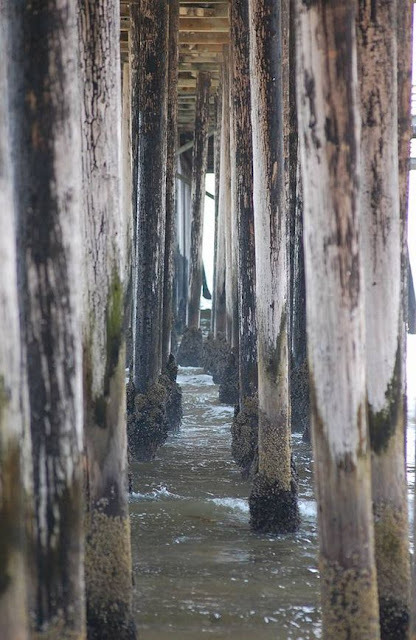 She turned facing the beach and started to call out, in the hope that someone might hear her, but with the whistle of the wind rushing round the underside of the pier, the sound was carried out to sea; it was hopeless. What had she been thinking? Not good things, clearly. Aided by two bottles of vodka she’d acted out a fantasy she’d had for a while. Although, as was always the case, it turned out the reality wasn’t going to go as smoothly as the fantasy: She hadn’t drowned in her sleep, and she hadn’t been rescued by anyone in shining armour - and scanning the still deserted beach she wasn’t going to be either. The water was up round her waist now. She wrestled with the rope, moving it further up the pole, and continued to chew on it. It was the only chance she had. Would the same courage it took to get into this situation, now get her out? Was she strong enough to save herself? Welcome back! I hope you all had a good summer. Now as we face the autumn I am rearing to go, with a litany of interesting photos at my disposal, and here's the first. 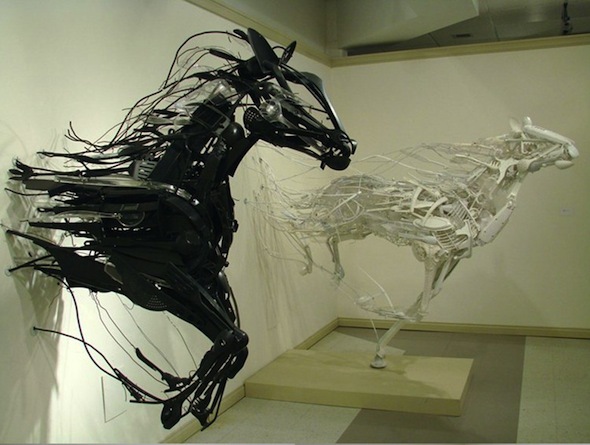 This week's photo is of a horse sculpture by Japanese artist, Sayaka Ganz. She creates sculptures out of household rubbish, as she says she has a “strange sympathy for discarded objects.” Apparently the Shinto (Japanese religion) believe in the sacred power (kami) in both animate and inanimate objects. All Syaka's animal sculptures appear to be moving in some way. You can find more of her incredible work on her website: Syaka Ganz, Reclaimed Creations. I recalled parts of this story from a dream I had had many years ago. It took me a while to squeeze it into the word count, and it begged to be continued. Maybe I will one day. Hope you enjoy it. I could feel the ground starting to shake, the thundering roar not quite drowning out my racing heart as I ran for my life. Then another sound reached me and I looked over my shoulder to see an entire band of wild horses coming, creating a sand storm in their wake; the thunder of their hooves reducing the magnitude of the quake as they approached. I looked for a high point, somewhere to scramble to, lest I be knocked and trampled underfoot. There was no shortage of boulders in this patch of the desert, so I climbed one, getting as high as I could until an idea came to me, making me ponder my sanity – not for the first time. As their steaming sweat-soaked bodies rushed by me I leapt knowing that I risked suicide. But catching a glimpse of the mammoth crack chasing the horses, it was my only chance of survival. Landing on the hard ridge of the animal’s back hurt, but I grappled in its mane for firm purchase and clenched my legs to stay on, keeping low. It made no attempt to buck me off, intent only on escaping the quake along with every other living thing. I could see bison to the left moving like a black cloud in high winds. I hoped we wouldn’t run across each others’ path. I attempted to look behind me but there was only a wall of sand. The sky grew dark, my initial thought being that the dust cloud had blotted out the sun, but when I looked up I realised the sky was full of flying creatures fleeing the disaster. Huge birds of prey mingled with flocks of parrots, sparrows, finches, ravens, every type of desert dwelling bird. I’d never seen so many and I’d spent a lot of time on my porch with binoculars trying. It scared me. How bad was this thing? How big? Would we be able to outrun it? I knew that the rocky terrain would turn into brush soon enough and then into farmland, until we eventually hit town. Although would it still be there? If the quake had hit my isolated homestead, where else was it hitting? I could feel the band of horses turning, moving to the right, the border of this scrap of land appearing on the horizon; the dark line of foliage would eventually grow into woods. I could see other groups of animals turning with us, foxes, coyotes, and even bighorn sheep running side by side. It was going to get messy once we hit the resistance of the trees. But as I watched, the foliage began to shift upwards; the ground becoming sky. Another fork of the quake was cutting the earth. The horses slowed down, moving back to the left. I waited for a clash of animals, but they moved as one, the pace increasing towards the open farmlands. I prayed to a God I didn’t believe in to keep our path open and let us escape this giant cataclysm, but the horizon started to darken with what appeared to be more groups of escaping animals - this time livestock - heading straight for us. I didn’t know why our band wasn’t slowing or changing direction, but before I could panic I was falling with the horse beneath me. My eyes had been so transfixed on what was ahead I had missed the chasm that had opened in front of us. My world went black. When I opened my eyes again I could see a crack of light. The weight on top of me made it difficult to breathe, but it was shifting and moving as other animals became conscious and struggled to rise. There was pain in my body, but would it stop me from being able to get up and out? Tremors were still running through the ground shifting the mass around me, and I used them to my advantage as I pulled and pushed my way up. It was hard work, but my body allowed it, despite one arm being broken. I hugged it to my side and tried to keep it immobile as I moved up. I had no idea how long it took me, but once I reached the top of the crushed, damaged and writhing creatures, I saw that it might have been the easiest part of my journey: The sheer wall of the chasm that faced me was galling – but I could try or die.